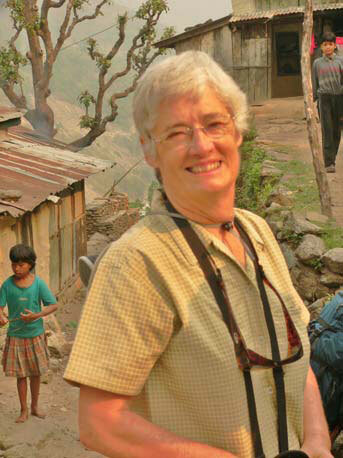 Last Trek Report – TREK REPORT – Annapurna Circuit, April 2010 - Trekking in Nepal with Teresa, Slow Trekking for peoples of all ages. Denis arrived early (1 April) so we wandered into Bouda together in the early evening for a stroll around the ancient stupa. Joining in this evening prayer ritual, or ‘Kora’, with the Tibetan community is really throwing yourself into Kathmandu’s cultural deep end. Next day (2 April) Alison and Liz joined us from Melbourne and Sydney respectively. We repeated the previous evening’s routine with Robina and Netra for company. 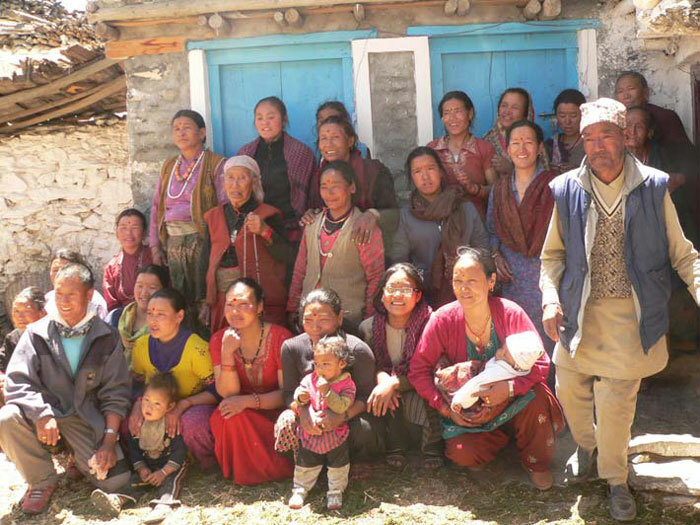 Netra manages the Bright Future Community Centre where Robina (veteran of Everest, Jomsom, Kali Gandaki and now Annapurna Base Camp treks) is volunteering for three months – and loving it! We never tire of the Garden Café with its excellent Paneer Butter Masala, served with real tandoor-cooked naan bread. We hired a minibus and took Dorje (our Kathmandu guide and veteran of at least a dozen treks with us) and Robina over to Pathan Durbar Square. It is a treasure trove of diff erent architectural styles as it has been added to over many centuries. The wooden support struts on the 14th, 15th and 16th century pagodas are extraordinarily suggestive. 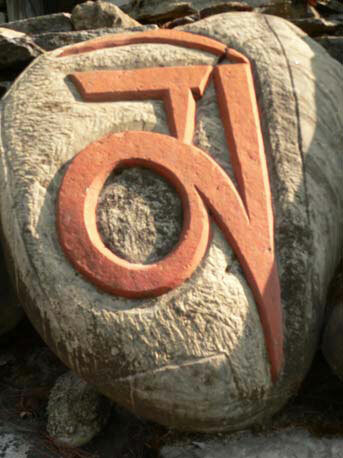 A lot of the ancient wooden and stone sculpture in the Kathmandu Valley has a lively sensuality. Even the male figures have curved hips and rounded stomachs and appear ready to dance right off the walls. We lunched in the grounds of the old palace, now a museum, but power cuts made a tour of the museum a pretty dismal prospect. We meandered through the old lanes for a while but it was a really hot day so by 1pm we headed back to Kopan. After a much-needed siesta we climbed up to Kopan gomba. Their lovely gardens looked great in the late spring sunshine. As usual the ‘eurobhuddists’ seemed a tad aloof after the friendliness of the locals. 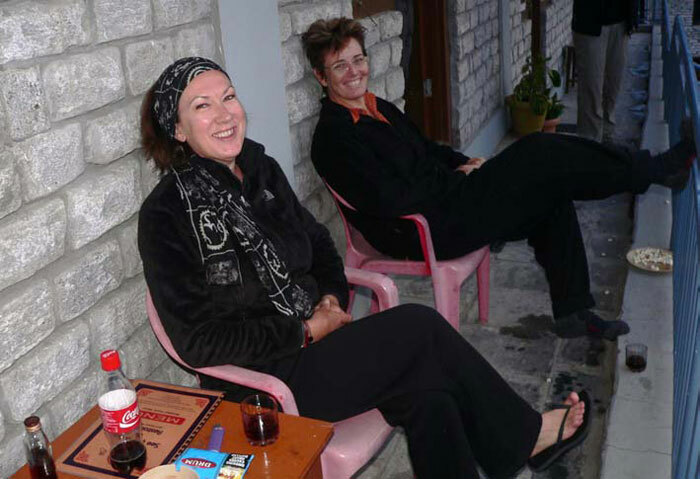 Back at the Shambala (our home base in Kathmandu) we ate outside in the garden. No electricity (again) but candlelight sufficed. The customers were all housed down at Muna Cottage (formerly known as ‘the annexe’) so much quieter than my room overlooking the main road – and right above a speed bump! Their dog Kale is still a bit too friendly and has to be reminded that not all the guests like her lying on their bed!! The official start day of our holiday saw me out at the airport for Cam and Faseny from Brisbane and Russ and Andy from Melbourne. The trio of Alison, Liz and Denis were sent in a taxi to Kimdol Bazaar – hopefully to meet Mangal who would take them up to Swayambhu. Bina, my favourite jewellery maker, had off ered to look out for their arrival. Of course she met their taxi and Alison then succumbed to a gorgeous silver bangle. Perhaps I should have warned them? We did Bouda again in the evening. It’s such a treat and nobody minds a repeat visit to the Garden Café. Today was the usual hideous mixture of moneychanging, gear shopping and final acquisition of odds and ends for the trek. Th amel is a backpacker’s ghetto these days but we were glad of the Weizen’s hospitality. We managed to escape by 3.30 so were back at the Shambala in time for a couple of hours of electricity. Yippee! Hair dryers and phone and camera battery chargers were all put to good use. New gear was stuff ed into new packs. Somehow it all fitted. We did try to cover some of the pre-trek briefing but were somewhat hampered by the consumption of Gossips Cabernet-Merlot. Who knew cheap wine could be this good? 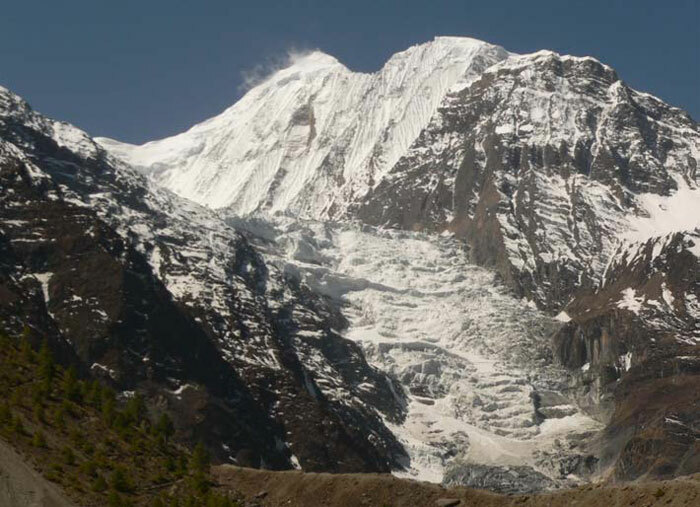 In the end we took a good look at the pictures (on this very laptop) of last year’s Annapurna Circuit trek in November. It did look good. We were all more than a bit keen to get cracking next day. I am writing this at 9pm in the Mongolian Hotel at Besi Sahar. It was a bit too hot today. We got away early after coffee and Danish in my room – 7.15 must be a record. Traffic was light on the ring road and we cleared the rim of the valley by about 8.30. However the first jam was waiting for us just a few kilometres over the pass. We tried stopping for a drink but the traffic was still snaggled just a bit further on. We decided to walk for a while and soon came upon an upturned scrap-metal truck. A bystander indicated that the driver had not survived. Very sad. The stupidity of other drivers compounded the situation and we just crawled along for a couple of hours. After lunch (yes, we only made The Hamlet for lunch) the traffic was flowing just fine but it was very hot. Over 30 degrees anyway. After a quick stop for refreshments near Dumre we were relieved to turn off the main road. 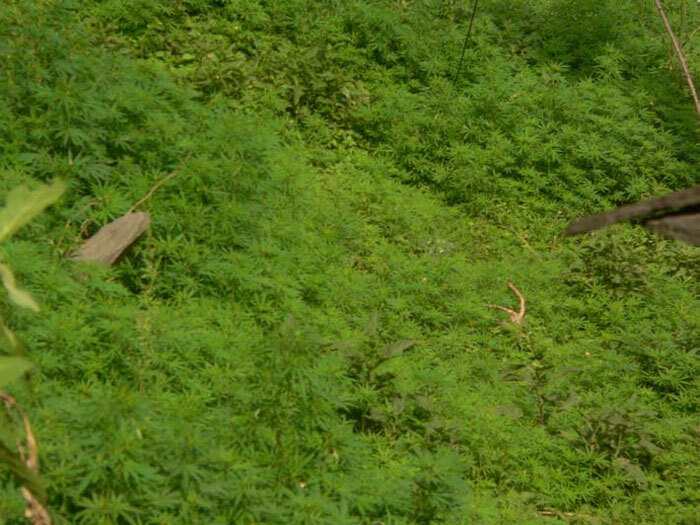 The countryside had become really green since I’d driven back from Pokhara three weeks earlier. The rice paddies were flooded and the crops were high. The rural scenery became even greener as we gained elevation and passed the Upper Marsyangdi Hydro Project. The lake is becoming huge and has a milky turquoise colour. The skies were quite hazy as we approached Besi Sahar with no view of Manaslu. Besi Sahar is getting quite large and the businesses seem to be prospering. After a refreshing shower we strolled the main street at dusk. Dinner was very tasty and afterwards we met up with our particular porters. Mangal, Dorje and Subash had travelled with us in the minibus from Kathmandu but the rest of the guys met us at Besi Sahar, having travelled up from Pokhara where they are based. Cam and Faseny have Kaji and Suman (our ‘new boy’). Purna is travelling with Denis. Mangal asked for Alison so that was an easy decision. Dorje and Prem took Russ and Andy (our anticipated front-runners). Liz is with Subash and I always take Lahar. Having risen well before 6 this morning everyone was ready to hit the hay by about 8 o’clock. Big day tomorrow – the real trekking starts! We all piled into our Indian-made bus and trundled along the 7 km road to Bhulbule on an appalling stretch of dirt track. Pitching and tossing on a trail with potholes the size of Volkswagens following the raging Marsyangdi River. This trek starts at a large, metal suspension bridge but we pulled up on the other side for our first cuppa. A hazy glimpse of Lamjung Himal was all the weather conditions allowed. The trail was very easy at first and conditions were still and cool. The countryside was extraordinarily green as there had been a lot of sunshine this particular April. The flat fields around Ngadi were mostly full of hip-high corn interspersed with a great-looking crop of potatoes. Lunch was an early stop as we’d eaten only a light breakfast. It took ages to arrive, something we would have to get used to. Everything is made from scratch here, including the bread. We were ravenous by the time the food arrived and devoured our veggie omelettes with chapattis in a lovely garden, shaded by a thatched shelter. After lunch the flats gave way to rolling hills and then the sharpish climb up to Bahun Danda. We couldn’t quite make it without one more stop. Icy cold coke never tasted so good. We took over the entire ground floor at the Superb View lodge. It is a bit rustic but well-run. Sitting under the huge mango tree, strung with coloured lights, mulling over our first day of trekking was very relaxing. Another group of twelve were staying too. Mostly young and rather uncommunicative. The French were friendlier – quelle surprise! Balmy night – no sleeping bag required. 6am bed tea. 6.30 breakfast. A theoretical start time of 7am. Well, it was our first day. By 7.30 we were off down the far side of Bahun Danda. Hazy again but quite cool because of it. Easy trekking through wheat and rice terraces in bright and dark greens. It took less than an hour to reach our regular morning tea stop but we decided to keep going. The rustic ‘bhatti’ or teahouse at Baisigaon was well-placed for a sit down cuppa. The loos were adequate, just about, and the variety of animals one met on the way to them was astounding. The original farmyard outhouse! The trail soon became a bit more upand- down as we approached Ghermu Phant, the scene of last year’s accident. (A German woman had a severely lacerated broken leg and had to be helicoptered out). Bad memories. As the morning wore on it became increasingly hot and muggy. It must have been close to 30 degrees by the time we reached Syange for lunch. Of course we had the chips – they were, as usual, excellent. Went down well with bowls of spicy veggie noodle soup. Denis was struggling a bit with a ‘dodgy tummy’ but bearing up well in spite of it. He slept through lunch and didn’t eat. Out of the starting blocks after lunch the new road was pretty hard going but with the altitude gain came a cool breeze at our backs. Higher still the views down into the gorge became spectacular. At the top of the steepest section we broke for tea with Jagat clearly visible half an hour up the road. The trail became easier and Denis seemed to get a second wind. Our lodge at Jagat was a three-storey timber monstrosity called the Eco House. It was painted as garishly as all the other purple/blue/green/pink lodges in this once picturesque village. Dinner outside after a rum and coke entrée was very pleasant indeed. Having showered off the worst of the day’s dust surely helped. At this stage I felt the group all seemed strong enough to make the pass, assuming the altitude doesn’t become too much of a factor. Liz keeps everyone entertained with tales of life as a corporate high flyer. Alison and Mangal are a great team. Andy seemed completely recovered from his recent brush with the notorious Kathmandu killer tummy bug. (2 days of plain rice and then a Mars bar probably did as much to sort him out as the medications). Perhaps Russ is finding the going a bit TOO easy after his trekking experiences in New Guinea. Denis is a delight to see on the trail with his sun umbrella and polite ways – quite the ‘sahib’. Faseny and Cam are a gold-mine of information in so many areas but curious to increase their knowledge too. Being from Brisbane the heat hasn’t fazed them at all. I confess I found it a bit hot, dusty and sweaty. I was hanging out for some fresher air and clearer views as we gained a bit of altitude. Still, there is a lot to see down here – farms, villages, waterfalls and always the roar of the river for company. A rather larger day today. We got up early for breakfast in the little garden and then off up the road on a somewhat cooler morning. The road to Chamje is finished though not in use yet so the going was pretty easy at first. We arrived in Chamje for a ridiculously early lunch – 9.30 am! – but managed some eggs and chapattis and soup as we knew there would be no ‘proper food’ till a very late lunch at Tal. I am writing this at 3.45 while the rest of the crew eat their meal. I had a coffee and a Mars. Must stop doing that. It was a steep, hot climb up here but luckily there was a breeze at our backs on most of the ridges. The road construction across the narrow gorge is awesome. We had just showered and washed a few clothes when we were drawn outside by a series of huge explosions. Watching the blasting along the road under construction was amazing. Huge boulders were blown into the air and a massive dust cloud filled the air. Regrettably the dust was blown up the valley, smothering our nice clean washing so we quickly ducked inside to avoid the same thing happening to ourselves. We had a great dinner – the cook really knows what she is doing here – then our boys entertained us with traditional folk songs and dancing. Top points for Kaji’s singing and guitar playing and Dorje’s madal (drums). Lahar and Mangal were the stand-outs on the dance floor but it was great to see the younger, shyer boys joining in. It was ten o’clock by the time we turned in and the youngsters were still dancing to Nepali pop music from someone’s mobile phone connected to the speakers on the otherwise defunct ghetto blaster. Another huge day. Lots of uphill but great variations in terrain. 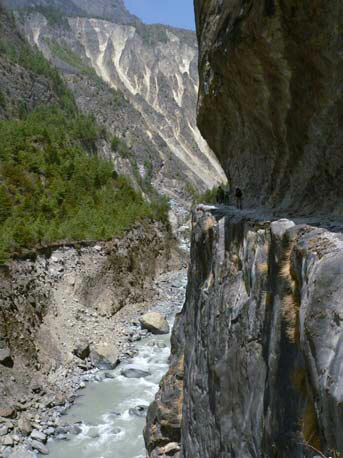 The very first section from Tal to the bridge is right beside the raging Marsyangdi River. The road to Dharapani (Tap Water) is mostly completed but the steep, dusty climbs to get on or off the incomplete sections were tedious in the extreme. There were loads of donkey caravans for the first hour as they, like us, started out from Tal this morning. Since the going was mostly steepish uphill we didn’t mind having to stop repeatedly to let the donkeys past. It was 2 hours before our first pit stop and we were trekking on the sunny side of the valley. A cup of tea was most welcome. Recrossing the river we trekked into Dharapani for lunch on the lovely old trail, high above the river with an exotic collection of plants clinging to the steep-sided valley. Lunch was a slow aff air which suited everyone just fine. The porters’ daal bhat was ready on arrival so, having eaten first, they mostly dozed on the lawns in the sunshine while we had lunch. It was quite breezy in the afternoon but still warm and we were soon sweating up the long, gradual incline to Bagarchap. By the time we got there Faseny and I were way behind the others with Lahar and young Suman for company. The completed road has yet to see any traffic so it makes for relatively easy trekking. Great to watch the scenery on these easier trails instead of checking every footfall. This area is only farmed on the scarce flat land. Most of the valley is far too steep-sided. By day’s end pine trees are beginning to dominate the landscape and once or twice I thought I could smell Daphne but didn’t see any. The Himalayan Lodge was a very welcome sight at around 4 pm. Everyone else had settled into their traditional wooden rooms by the time Faseny and I arrived. The lodge reminds me of an old wooden sailing ship with rooms off the poop deck perhaps. I am writing this at 5.30, no view of Manaslu back down the valley – pity. The wind has dropped but it’s still not cold enough to break out any seriously warm clothes. I did unpack my sleeping bag. We saw our first really good snow-capped mountains this morning. At last. As we climbed up to the ridge at Timang the huge gleaming presence of Manaslu was taunting us through the haze. I always forget how enormous it is! This little hidden valley is quite lush and the cicadas made it feel a bit like bushwalking in Australia. Scattered rhododendrons in clear red were still in evidence, though no profusion. The peris was flowering profusely and the ‘snake corn’ was eagerly photographed by Denis and Faseny. Morning tea at Timang saw us all collapsing in a heap. It was a rather long, hot climb. The breeze kicked in after that and the walking was far easier – apart from the steep dip down to the bridge just before Th anchok which, of course, necessitates an arduous climb up the dusty cliff on the far bank. Time hasn’t really caught up with Th anchok. Women bent double hoeing the stony fields; men urging their oxen to pull their traditional ploughs. I don’t suppose medieval Europe was much diff erent. Kamal (our runner) had gone ahead to organise lunch as the cooking is usually interminably slow up here. It was daal bhat all round, a particularly good one. I noticed that nearly everyone took second and third helpings on the curried veg. The afternoon’s walk was a delight. A slight ascent for half an hour and then a couple of hours of gradual descent through the pine forest to Chame. We gradually gathered in a shady spot below Koto and chilled out for half an hour while a couple of local girls of about 6 or 8 years old entertained us with their extravagant posing for the camera. Liz gave Dorje a golf lesson. In Chame we decided to try the Shangri-La Lodge this time around – in deference to Frank’s experience with the rat last season at the Marsyangdi Mandala. So far, so good. Attached bathrooms (well, toilet and basin anyway) and wide beds with thick foam mattresses. This is a much bigger village than those encountered so far. My phone is on charge in anticipation of a signal and several new ‘cyber cafes’ have appeared since last season. I am off to explore. Idiotically I tripped up in the street and appear to have damaged my hip or thigh muscles (or both). Lots of lotions and potions from Alison and a hot water bottle made things feel a lot better by morning but far from 100%. Bugger! Cooking was excellent at this lodge – will definitely stay here again. It was a rather long haul up to Pisang but we were so encouraged by the clear conditions we set off in good spirits. With Annapurna II ahead we did the long gradual climb up to Bharatang in bright clear sunshine. There were only three chocolate croissants left at the bakery but we shared them around, added some delicious cream biscuits, and this tided us over till our late lunch. After morning tea the trail rises onto a cliff -hanging ledge with the kind of drop down to the river that makes your knees turn to jelly if you peep over the edge. After crossing the river on a very windy suspension bridge it’s a short ‘pig’ of a climb up to the pine forest’s deep shade. In amongst the usual dross for sale at the goth Alison found a great pair of Tibetan felt boots. Living near Paris and being an art dealer she had a great eye for the unusual and artistic. After some spirited bargaining we moved on with both Alison and the vendor happy with the deal. The sound of the wind through pines accompanied us for the next hour. Still uphill but shady now and rather lovely, especially in the little grove of chortens and ancient chautaras right in the middle of the woods where we stopped for a spell. It was hot on the sundeck at Dukur Pokhari (Bird Lake) and it was crowded with people from all over the world – many of them with the same goal as ourselves – the Thorong La. After lunch, the trail into Pisang is dead easy, descending through pines and junipers to a wide open valley floor where a few horses and cows grazed contentedly. The rustic old stone and timber houses of Pisang soon hove into view. The tiny cabins at the Eco Lodge were cosy and it was our first night to have the dining room stove fired up. It was very snug in the dining room but we had all had a big day of climbing and were now up at around 3,000 m. Everyone was in bed by 8 pm. The late afternoon clouds had been replaced by a canopy of stars – a good omen! It was fairly clear this morning but not the perfectly clear day we had hoped for. Five of the group opted for the ‘high trail’ over Gyaru and Ngawal so Cam, Faseny, Denis, Russell and Andy set off with Dorje in the role of guide and Suman, Khaji, Purna and Prem as their support team. Myself, Liz and Alison took the lower trail which, though easier, was still a 15k hike with a 300 metre climb to start the day. We lunched at the gorgeous little Snowland Lodge, a real favourite of mine. A top daal bhat lunch and a real treat afterwards as the wind picked up and blew the clouds away. As the mountains became clearer we headed off rather quickly as the best possible views of Annapurna IV and II were just around the corner from Humde and there was no way I wanted to miss out. We were very lucky. The weather held clear for about 2 hours while we walked past the absolute pick of views, only clouding up again as we neared Braga. An encounter with a travelling Sadhu at Mungi was fun and, with a strong wind at our backs, we used up the last of our energy to climb up to Manang. All pretty exhausted but otherwise fine. The A Team stayed overnight at Braga, Manang being just that bit too far after such an arduous climb over the high trail. We heard that they were all safe and well – good mobile phone signal up here – and looked forward to hearing how it went for them the next day. They were expected mid-morning. As I write this the afternoon’s stormy weather has passed. The skies are clear and there is no wind at all. Roll on tomorrow! P.S. 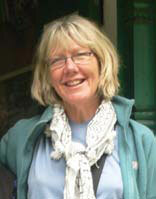 we heard today that Lisa will not be joining us at Muktinath due to her father’s declining health – sorry to hear that. Hope you make it next time! Rest day in Manang. After a good lie-in we couldn’t but help get outside for a look at the day. It was absolutely perfect. The A Team had a look around Braga and then walked the 45 minutes up to Manang in brilliant sunshine. I’d never before experienced Manang so warm. Had never been here so late in the spring season. Alison opted for the gruelling climb up to the gomba for a blessing from the famous lama there. I think it was a fair bit harder than she expected. (I checked later – it looks like 800 metres plus.) 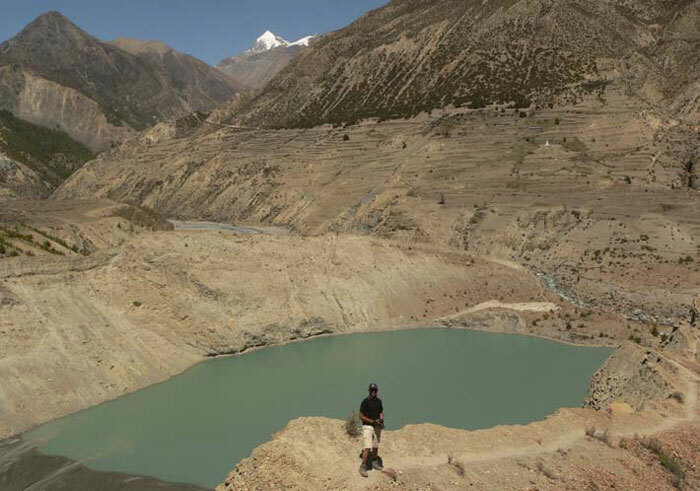 I took Liz, Russell and Andy over to the lake at the bottom of the Gangapurna Glacier. All four of us made it to the tea house above the lake – an arduous climb but such amazing views of the glacier. After a long time spent gazing at the stupendous view (or recovering??) Andy and Russ opted for the further climb to the top of the trail. Can’t wait to see Andy’s photos. ‘Well worth the eff ort’ said both afterwards. I think young Andy was starting to get the hang of the ‘joy function’. Sometimes ‘Yeah, it was all right’ just wasn’t enough and this place really redefines ‘Awesome’. We spent the afternoon on domestic stuff like hot showers, hair washing and laundry. After an early dinner Faseny, Cam, Russ and Andy visited the movie theatre to see ‘7 Years in Tibet’ – what else? Not needing an early start today we did a little ‘faffing around’ prior to take off . The internet was on in the café below the lodge but at 10 rupees (15c) per minute I didn’t hang around. The day was perfectly clear – again – so we really dawdled in the warm, sunny conditions stopping at every opportunity. Consequently it took nearly three hours to reach Gunsang for lunch. 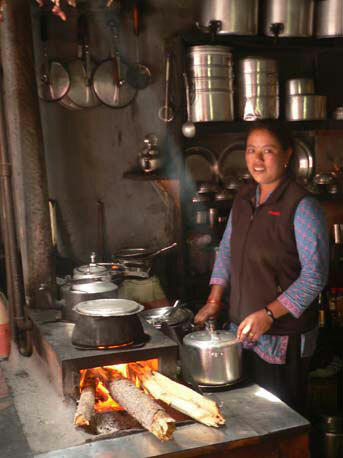 We ordered stacks of chapattis and made some cheese sandwiches with Yak cheese I bought in Manang – it made a change anyway. The wooden dining deck was pretty rustic but with million dollar views. The going was much easier after lunch but still a long haul. The view behind us was beautiful as we walked away from the main Annapurna range and we had to keep turning around for ‘one last look’. Actually the range turned out to be visible from the upstairs dining room of the lodge. My room is a cute little cabin painted completely pink inside. Very cosy if a little womb-like. Today was hard. Damned hard! We gained almost 450 metres between Yak Kharka and Thorong Phedi. Even slight uphill walking is rendered difficult by the lack of oxygen resulting from lower air pressure up here. However, we all made it by lunchtime and in pretty good shape. A bit worn out but no serious ‘altitude issues’ so far. It was another blazing sun, clear air kind of day and we walked in t-shirts most of the time. The landscape had become bleaker and bleaker as we ascended. At first there were half-metre high stunted pines and junipers interspersed with wild briar roses which seemed to produce mostly thorns. There were a couple of stands of Himalayan birch in the more sheltered gullies. Yaks abounded with lots of young ones in evidence. At the Thorong La summit. Hard to recognise everybody... I can’t tell who is missing (i.e. taking the photo). We took tea at Ladar and then continued climbing till a steep descent took us down to a plank bridge across the Jharsang Khola (river). The river runs clear and fast here as the trail climbs high above it. The climb out of the gully was a pig (well, more than one actually) and everyone needed a good sit-down at the top where the teahouse used to be. The bhatti was burned down by robbers last season and the owners were lucky to escape with their lives. 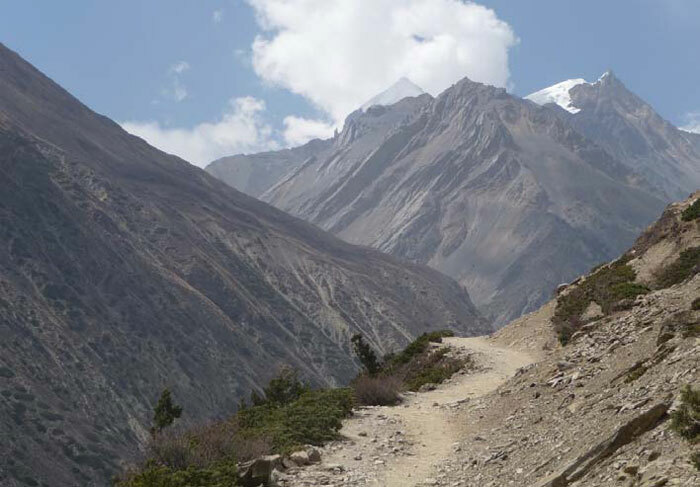 The long slight incline to Thorong Phedi seemed to last forever. Luckily Alison had a jam chapatti which we shared to keep us going. We arrived before midday which I thought was a good eff ort. Took a much-needed rest this afternoon. However, some of us braved the dreaded 1-kilometre track to High Camp as an acclimatisation exercise. It is one of the hardest sections on the trek (another ‘pig’) and takes at least an hour to cover the 1 km. Cam and I only made it about half way but it was better than nothing. Andy, Russ and Denis went right up to and above the High Camp. Theoretically, all this eff ort will help us sleep at altitude tonight. Our lodge is nestled at 4,500 metres and you can really feel it. The ‘big push’. Man, it was hard. We had planned to rise at 3.15am, breakfast at 3.30 and hit the road at 4 am. Everything went according to plan. The first torchlight procession up to High Camp was strenuous in the extreme but we made it in just over an hour. Big mugs of tea all round and then more serious uphill trekking. At times like this there is a bit of muttering amongst the members about Bali or Phuket for next year’s holiday. The trail does get a bit easier as it gets higher but this factor is cancelled out by the decrease in oxygen available. It is all quite hard work over 5,000 metres. Andy seemed to handle it better than most and took line honours at the pass. Denis was also quite strong uphill and not too phased by the altitude. 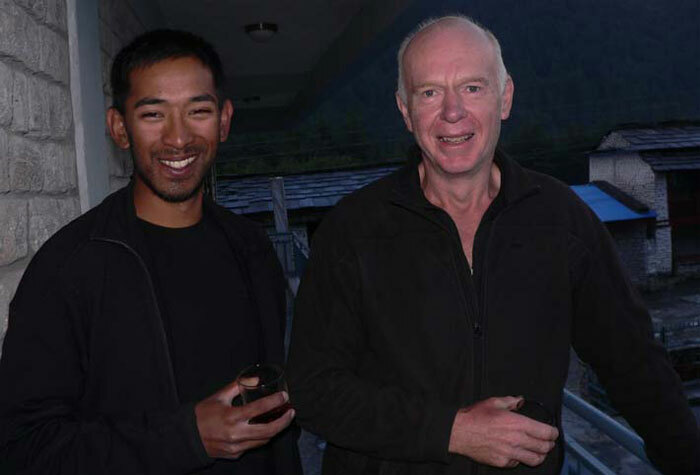 Prem hiked back from the summit with a thermos of tea – he even brought cups and a sugar bowl and spoon. Alison, Liz and myself eagerly slumped down for a break, sharing our treat with two young Israeli girls and their porter who were just as slow as us. Lahar assured us we had 2 hours to go but with Prem taking our day-packs we made it an hour later at 10am. Whew! It was a beautiful, clear sunny day. I can’t find words to describe just how beautiful it was up there. Mindblowing views in every direction, glaciers just above us. Wonderful stuff . The pass itself was great. Enraptured hugs and congrats all round. Lots of photos and then the ritual hanging of prayer flags. Alison had brought one string each for her three children which had been blessed by the monks at Bouda. Well done everyone! The descent was long. Long and steeply descending with a lot of loose material on the trail. We collapsed in a heap several times, beyond caring about dirty, dusty conditions. 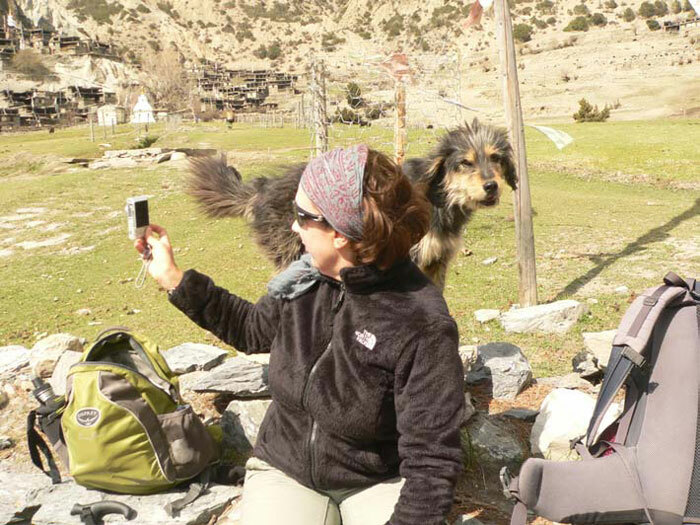 Alison was first into Muktinath Phedi on her ‘skier’s legs’. The rest of us hobbled into Phedi around 2.30, ate some food (no idea what) and then limped the last dusty hour into Muktinath. Tired but otherwise fine. Most of us slept till dinner. I was almost too tired to eat – now that was a BIG DAY OUT! Faseny, Denis, Alison, Russ and Andy went up to the temple while Cam, myself and Liz enjoyed some very welcome down time. 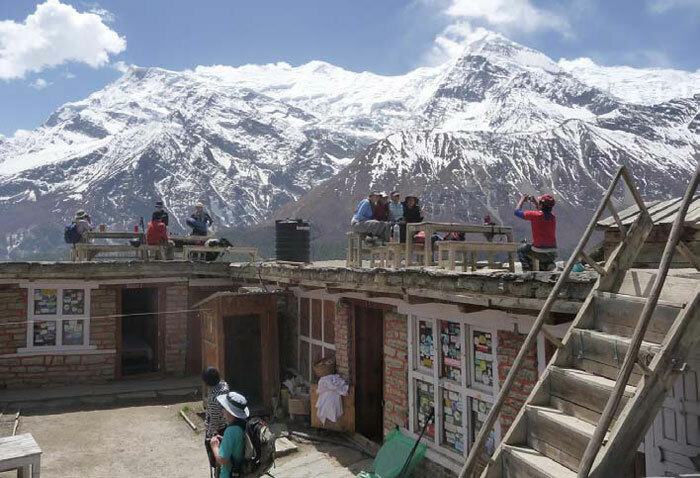 I sat on the little sun-trap of a deck drinking tea with Dhaulagiri glistening furtively in the distance and the buzz of village life carrying on below me. Noisy motor-bikes disturbed the tranquillity a bit as they ferried fat Indian tourists in brilliant saris up to the temple – is it really a pilgrimage if you don’t even walk the last twenty minutes? Within a couple of hours the group were back having thoroughly enjoyed their visit to this ‘holy of holies’ especially our porters for whom a trip to Muktinath is very special indeed. We set off down the hill to Kagbeni in warm sunshine – no jacket required. By the time we had had a bit of a look around Jharkot it was closing in on lunchtime so we took advantage of the excellent cooking at the New Plaza. Best fried rice of the trip, bar none. ‘Best daal bhat of the trip’ was the comment from the Porters. Must have been the fresh veggies from the little hot-house in the garden. Liz and myself were the last ones in today as we took a long break at the Blue Sheep for a lemonade. Descending on Kagbeni was wonderful. An emerald sea of millet and barley swirling in the wind made a stark contrast with the dun-coloured hills all around us. An oasis. The Asia Lodge at Kagbeni is always a treat and this time we had planned a two-night stopover. The comforts of attached bathrooms with western loos and the hottest of solar hot water were very welcome. 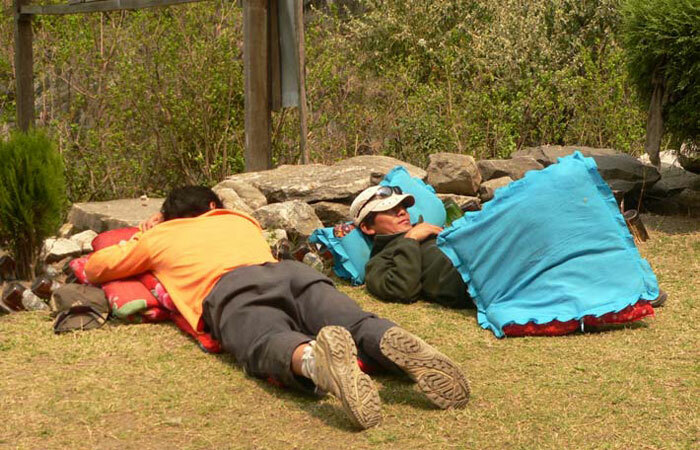 A pleasure to leave our constrictive sleeping-bags in our packs and use the clean quilts and soft pillows provided. Heaven. By 7pm Khaji was tuning his guitar. A madal was found for Dorje and the younger boys started the dancing and everyone soon joined in. Another great night in Kagbeni. A late (7 am) bed tea and a slow breakfast marked the start of our rest day in Kagbeni. 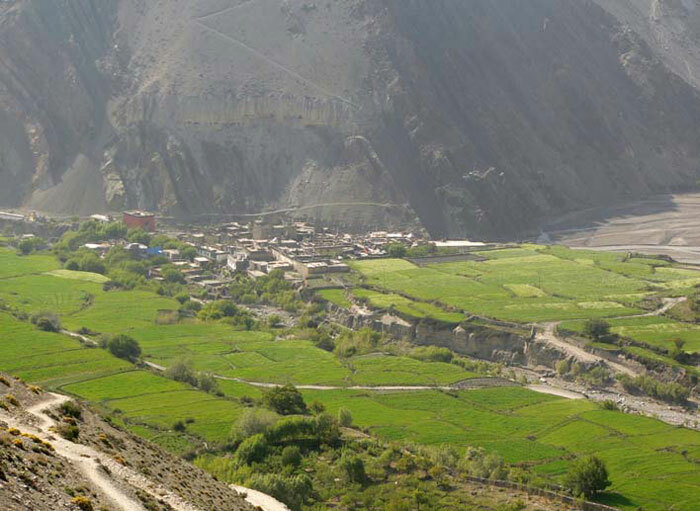 With masses of washing hung out to dry Lahar and Mangal took the group out to Thiri in Upper Mustang. A $700 US permit is still required for a 10-day visit to this previously forbidden kingdom so it is lovely to be allowed to visit, if just for a couple of hours. 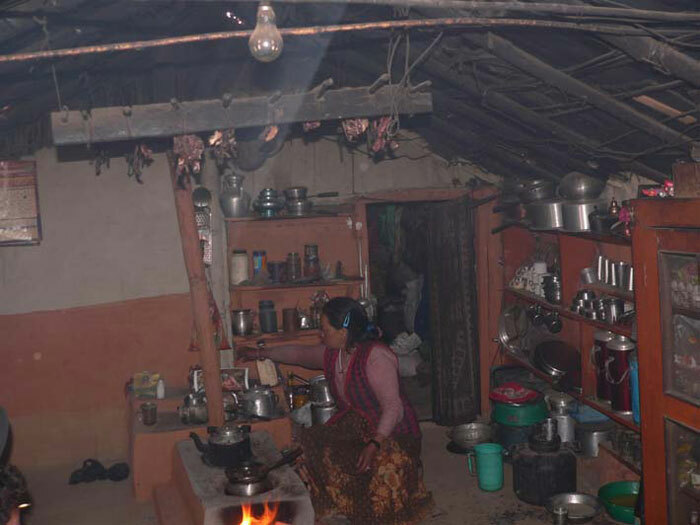 The tiny village of Thiri gives a fascinating glimpse of life in the Kingdom of Lo Mantang. Conditions are ideal as I write this journal. Bright sunshine, breezy but warm. Every window in the lodge is open and most of the porters are basking in the sun on the grass out front. By and large the clients are in very good shape and we are quietly smug at having made the pass without casualties. Well done us! 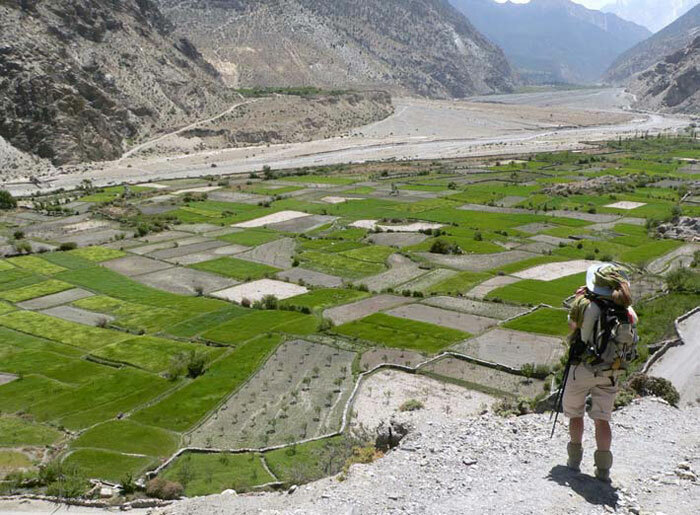 The trip to Thiri was a success with access along the rather dodgy west bank of the Kali Gandaki River. Pema was a gracious hostess, as ever, and some of the group climbed up to the gomba which I thought was an impressive eff ort. The lodge is much quieter today. All the youngsters have left and only a smattering of new people has arrived. There is the sound of monks chanting coming from the puja (prayer) room and the smell of heavenly incense waft ing through the corridors. This afternoon the group visited the 500-year-old gomba. It is almost totally unrestored which appeals to my sensibilities. 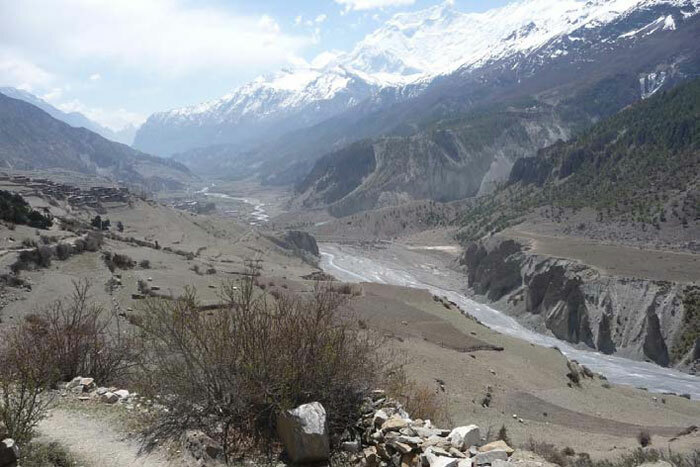 A quieter night has been planned for this evening as we hope to get away really early tomorrow to avoid the worst of the afternoon winds in the wide, open Kali Gandaki valley. We got away to a flying start this morning. It was a little bit overcast although Nilgiri was looming large as we approached Jomsom just after 10 am. I had oft en walked this trail with low, thorny scrub along the trail. In mid-April it was in full bloom. 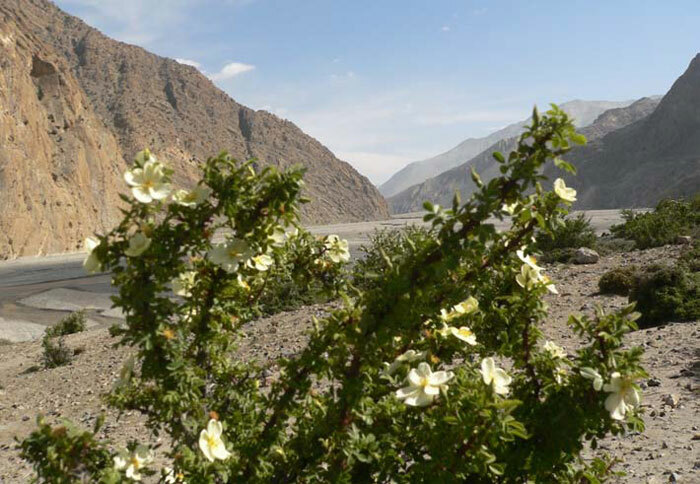 Bright yellow gorse-like shrubs and masses of creamycoloured desert roses, faintly yellow in their centres with a sweet perfume. Little villages or patches of cultivated land were emerald green. A first-class coffee (made in a cafeteria) was a welcome brew at the Marco Polo. It was very windy indeed (what else, this is Jomsom) as we walked around to Mangal’s home village of Shyang. Since it was fairly early we opted to go via the upper village where Mangal’s family were having a get-together. We were brought tea on the rooftop and then the entire family gathered to pose for a group photo. There must have been at least thirty people in that house, mainly women. Everyone seemed to be Mangal’s aunty. Cheering them all goodbye it was a long, dusty 40 minutes to Marpha. The trail was easy but the grit in our eyes and teeth was no fun. Marpha was delightful as usual. Quaint, whitewashed houses facing narrow lanes to avoid the wind – this looks more like the Greek islands. After some excellent veggie soup it was back out into the wind. Happily, we crossed the wobbly old bridge to Chairo and walked behind the belt of pines and junipers on the east bank of the river. It was spitting rain for the last hour or so which was rather pleasant as it was quite warm. 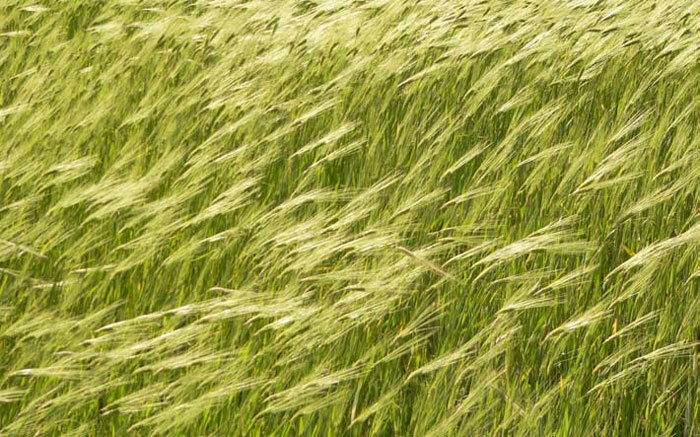 Verdant fields of barley swirled in the shift ing winds and ever-changing light as the sun played hide-and-seek. By Frank Jones’ reckoning this is a 23km day – it felt like more. The water in the showers was hot on arrival at Tukuche and we soon had a rum-and-coke set up on the rooftop dining area. A satisfying day out. With 6.30 bed tea for an early start and breakfast over by 7.30 the group took a ‘cook’s tour’ of Tukuche; the mani wall, old houses, distillery, old gombas. On the road by 9 and out onto the broad river bed ten minutes later. This maze of interconnected log bridges is not the easiest to navigate but, somehow, about an hour later, we found ourselves on the far side of the Kali Gandaki. We took a cup of tea from the kindly old lady in what looked like a humpy on the riverbank. It was very good tea, prepared over an open fire in her primitive little home which was extremely well-kept inside. We stayed hard up against the east bank as we headed south. It was a long, looping route which took us into a previously unknown (to me) village of small farms. Before too long we were ambling through pine forest with an abundance of spring flowers (azaleas, violets, tiny wild strawberries) ferns, nettles, thistles and many varied pines and chestnut trees. At Kokethanti we needed a break even though we only had less than an hour to go. Liz, Andy and Russ were way ahead of us (apparently eating lunch at the lodge already). When the spitting rain turned to hail we decided to stay for lunch at the aptly named Ice Fall Lodge. By the time the rain eased and we headed into Kalopani it was after 3 pm so we decided to make a short camp at the beautiful See You Lodge instead of going on to Ghasa. So glad we did. 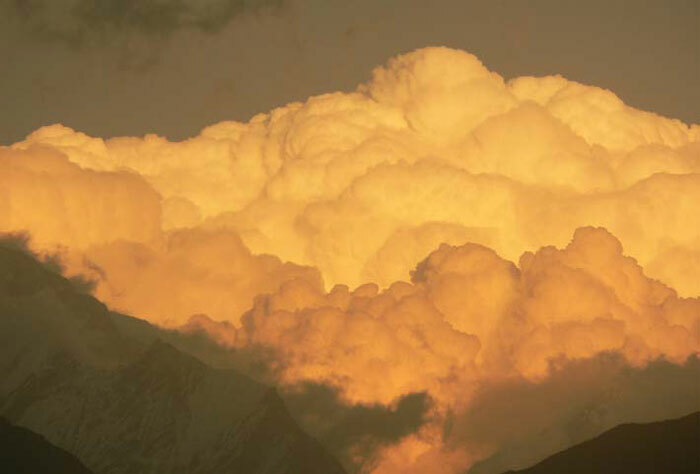 As the skies cleared the sun on Bara Shikar and Annapurna I was stunning. We set up drinks on the ‘upistairs’ balcony and watched nature’s light show till sundown. We have a few more girls to dance with. 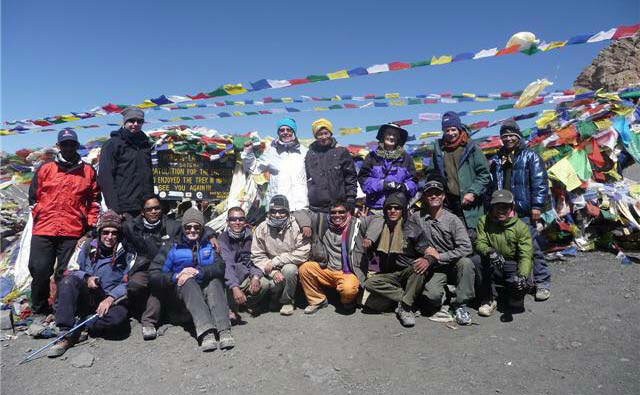 A group of fellow trekkers had a guide and several porters from Chetri sisters who specialise in all female staff . Hard to believe these diminutive, pretty girls carry packs all day and still have the energy to dance. A totally fab day. ‘Danyamate’ – a hybrid of Dhanyabad (thank you) and Good-on-ya-mate. Thanks Liz. This turned out to be a really huge day. Having stayed at Kalopani last night I decided to make up the extra three hours today. Perhaps not the best decision I made on this trek. The walk down to Ghasa was delightful, even on the road. The garden at the Eagle Nest in Ghasa, where we took lunch, was ablaze with Sweet William, Marigold and Poppies with hundreds of small butterflies flitting amongst them. Shiva made a great dish of veg macaroni while we sackedout in the cool of the dining room. It had become quite warm. After lunch we crossed the huge bridge below Ghasa while the boys took all the heavy bags on the bus down to Tatopani. It was a long, steep descent so we were pretty tired by afternoon tea beside the waterfall at Rupse Chhahara. Some of the group went to view the gorge – ‘World’s deepest’, I don’t think so! The road down to Tatopani seemed endless on tired legs and we staggered into Tatopani at around 5 pm totally exhausted – we had walked another 23 kilometres. Unfortunately I got bitten by a large ant and immediately broke out into a lumpy red allergic rash and had to take antihistamines. Probably one tablet would have been enough but I took two, to be sure, and paid the price the next day. This was a difficult day for most of us although Russ and Andy were in the lodge by 11 am! It was very hot and very steep uphill – an unpleasant combination at the best of times. I battled through an antihistamine ‘hangover’ and dragged myself into the lodge with Lahar at 4 pm. My worst day. The Queenslanders, Cam, Faseny and Liz seemed to cope with the conditions better than me and the walking was certainly picturesque. Harvesting of crops, ploughing for summer crops and lots of small domestic chores being done outside kept us interested along the trail. Sikha is a charming old village with marble slab steps climbing up and down between old stone houses. The Norwegians were at the Moonlight Lodge with us. Our boys made great use of their new-found (quite literally) badminton rackets. The climb up to Ghorepani was a tough one – 900 metres – however, there was a cooling breeze as we ascended to 2880 metres. Along with shady rhododendron forest and increasing cloud it was almost pleasant. It was too cloudy for peak viewing although Dhaulagiri was looming mistily in the distance when we woke up this morning. Morning tea at Chitre was very pleasant on the big lawn. The boys took advantage of the space to play badminton, again. We arrived at Ghorepani in time for lunch and a well-earned rest after our two big climbing days. It is almost beyond belief that people make the climb from Tatopani to Ghorepani in one day. I am off to see if the internet is running and then perhaps a serious snooze. The ‘weeds’ are taking over the back garden!! We sat in the sun in the village square, such as it is, waiting for the power to come on. Even when it did the internet was profoundly slow. We had a bit of dancing in the evening though the lodge was hushed by 9 am. During the night I had awoken to see Annapurna South glowing in the moonlight but it was not perfectly clear this morning. 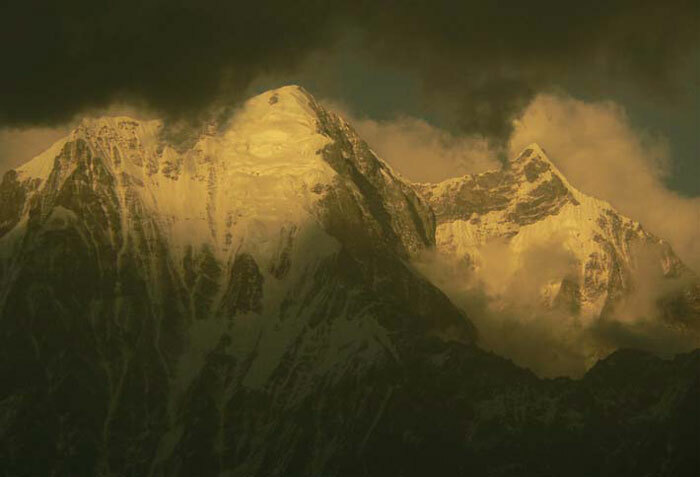 Dhaulagiri looked enormous looming out of the mist. We set off early enough to get a few good views on the way up to Deorali. This ridge, on the opposite side of Ghorepani from Pun Hill, is just as good a viewing platform as the famous hill but without all the tourists – and it is on the way to Tadapani. The walk was wonderful. The last few rhododendrons had hung on for us and the undergrowth was lush and dotted with spring flowers. Mainly white violets and wild strawberries though we did see white clematis snaggling through some birch trees here and there. The trail wound across the ridge through a labyrinth of rhododendron branches and roots. The older trees played host to a wide variety of epiphytes. We had only had a light breakfast so at Deorali we got stuck into really juicy veggie omelettes in chapattis. The lodge nestled in a gully full of deep pink rhodis. Another pit stop at Banthanti was just as picturesque and a much-needed rest after a torturous descent on what appeared to be a spiral stone staircase. We took the last hour very slowly, especially the climb at the end (2 pigs). We saw a family of langur monkeys with their distinctive black faces and white manes. It was pretty cloudy on the mountains as we arrived in the little village of Tadapani (far water) but the sun spilled down on the lodge all afternoon. I thought my rather simple room a bit gloomy till I opened the shutters on the back window and the room filled with sunshine and birdsong. Charming. The Mothers Committee of the village had asked if they could dance for us in the evening after dinner and it turned into another magical night of singing and dancing under the almost full moon. The Norwegians were there too. Kaji and our boys reciprocated with a few songs of their own which sounded great with the female voices blended in. Another great day. We had only about 4 hours of walking to do today, all of it downhill, so we lingered on the sunny terrace over breakfast even though we got up very early to see the sun rise over the mountains. 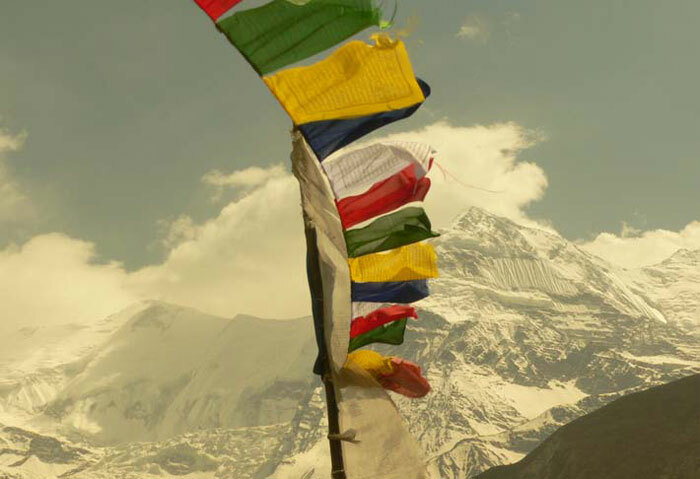 It wasn’t the best but clear enough to see Annapurna South and Machhapuchhre right in front of us. Denis, Faseny and Cam headed off around 8 am, champing at the bit for more jungle bashing. The rest of us lollygagged till 9 and then it was down, down and more down to Ghandruk. A much gentler descent that yesterday made the going fairly easy. The forest even more lush than ever in the warmer conditions. A truly beautiful walk. It got a lot hotter as we descended but just as it got ‘too hot’ a breeze sprang up and conditions clouded over. Once in the lodge a drizzling rain persisted though it was fine enough for a walk around the village, one of the loveliest in the region, in the late afternoon. Great to see such a clean crew at dinner this evening. Sadly for us Subash had to leave us today. He figured that if he set off straight after lunch he would just make it back to his home village to sit his English exams. Of course we didn’t mind but it was a shame to suddenly be reminded that it was all coming to an end. He had been Liz’ porter and she gave him the perfect parting gift – a mirror. Nobody checks their hair (or rings their Mum??) more than Subash. We miss him already. It was a long but easy walk from Ghandruk to Birethanti. We rose early to see the mountains but it was a bit hazy. We took advantage of our early start and headed off down the stone stairs by 7 am. A couple of times we needed a reminder (thanks Faseny) to look back over our shoulder as Annapurna South seemed to loom larger and larger the further we descended. Just when our knees were screaming ‘enough!’ we reached the river, the Madi Khola at Syauli Bazaar where a long, well-made dirt road led us into town. A connection to the main road at NyaPul has yet to be established so the only traffic was mule trains and people on foot. We passed quite a few fresh trekkers setting off on their first day and, sad to say, quite a lot of overloaded porters. It was steaming hot by the time we reached Birethanti at midday. The boys were soon down to their jocks, swimming in the river below the Green View Lodge. Chilled banana lassis were wonderful. We heard that our bus was waiting and half an hour later, by various routes, we re-assembled on the roadside where our ugly pink bus awaited. In just over an hour we were being shown into the 2-star ‘luxury’ of the Lake Diamond Hotel. Little things like sheets and soft pillows, clean towels and toilet paper, mango juice and fresh-brewed coffee were enough to raise our comfort levels to ‘ecstatic’. Single rooms alone felt like luxury. Some of us had to shop for a clean shirt but we took our dinner at home. Sanu’s special daal bhat with chicken curry went down a treat. The power came on around 7 pm and we soon had the fans in the bedrooms whirring overhead. The storm clouds which had been rumbling morosely for hours finally let go and the pouring rain soon cooled the atmosphere. I hope everyone else slept as soundly as I did with the backdrop of tropical night sounds – rain, insects, fans and geckos. Loved it. No plans for this afternoon – heaven! Most of the group lingered at the shops and restaurants of Lakeside after their boat trip. We got together with the porters for a decent dinner this evening at the Mira. Most of us kicked on at the Busy Bee afterwards. The music was not very good really but it was live and rocking and, after a couple of drinks, we didn’t mind too much as we hit the dance floor. The band’s version of Rishan Phiri Ri really rocked. We tried to catch a glimpse of the ‘stairway to heaven’ as the locals call the moonlight on the lake. It was too early in the evening but the moon was luminous and full. We got lucky a bit later from the terrace of the Lake Diamond when we saw the major peaks of the Annapurnas glimmering faintly in the moonlight. We were up early for the Greenline bus as I had forgotten that the new departure time is now 8am and not 7.30. The peaks were not perfectly clear as we left Pokhara but plainly visible – at least for those of us who were awake. For the first time in ages we had a clear run with the bus and arrived more or less on time. The buff et at the Riverside Lodge was the usual daal bhat (which I like). Although our minibus was waiting for us at Greenline in Kathmandu we had to wait out a huge downpour to retrieve our luggage from the coach. We then had to stuff all the bags inside the minibus with us which was a bit squeezy – too wet on the roof. Dinner at the Shambala washed down with a little bit too much Gossips Cabernet Merlot while we regaled Robina and Netra with tall tales and true of how we conquered Thorong La. We got our own minibus into Th amel today. Cam and Faseny (Cameny??) set off with Liz’ Lonely Planet and guided themselves around the old part of Kathmandu. They were pretty disappointed and discovered why I sometimes don’t want to do Durbar Square. The whole area has degenerated into a bit of a tourist circus. If you don’t get hassled to death by tour guides or street vendors you will probably get run over by taxis. Russ and Andy tried to organise their Chitwan trip but with May Day mass rallies planned for next day and a full-blown strike (strictly enforced) for May 2nd, they found it hard to get a commitment. Meanwhile, I took Liz, Alison and Robina to my favourite ‘girlie shops’ for an up-market Nepali fashionista experience. Alison bought a fabulous outfit with jingling bells dangling from the scarf and Robina and I bought really cool tops in Indian cottons. By 3.30 we had had enough of Th amel which has become a rather oppressive backpacker’s ghetto these days. Instead we got our minibus home to the haven of Kopan and regrouped around 5pm to revisit Bouda. This is always a pleasure and the food at the Garden Café never disappoints. Dorje joined us having spent all afternoon at the domestic arrivals terminal (I had already ordered his chicken sizzler). I am using the word ‘terminal’ very loosely here. However, Denis had survived his interminable wait for a flight and we heard he was recovering nicely back at the ranch. The city really wears me out and we were all glad of an early night. We heard that upwards of half a million people had gathered in the city and we were ‘strongly advised’ to stick to our own neighbourhood. Despite the socalled holiday our hotel did a good breakfast before closing up for the day. With options severely limited, I organised some young guides – actually Netra’s niece and sister Rangita and Susma – to take Cam, Faseny, Denis and Russ up to Kopan. I figured that at least their restaurant was likely to be operational – it was. I took Liz, Alison and Andy to the Tranquillity Spa for a serious massage. It was a real treat. Andy’s first massage. Liz and I had manicure and pedicure but as poor Liz was a bit under-the weather I think she just ‘survived’ hers rather than enjoying it. In a further ‘comedy of errors’ Liz somehow found herself stranded at the spa. Luckily, she found her way back to the Hyatt (a fairly large landmark in these parts). Liz and Alison had moved to the Hyatt for their last night. Mainly out of a desire for a bit of serious luxury on their last night but it was also a good bet that the government’s airport shuttle would call there. It was the only vehicle which could legitimately break the strike. The swimming pool was a definite attraction, especially as they invited Dorje, with his wife and two sons, to come and visit in the afternoon. With this evening’s planned trip to Swayambhunath a definite scratching Cam, Faseny and Denis had a home-made daal bhat from Muna – the best in Nepal I hear. Liz and Alison invited Andy, Russ and myself to eat at the Hyatt. I think it was possibly the best meal I have ever eaten. Because of the political turmoil the dinner was ‘buff et only’. But what a buff et! We waddled home around 9 pm, our stomachs full to bursting. Hey, it was ‘all you can eat!’. Even though a few little grocery shops were open this morning the strike was widespread with no transport whatsoever. I had heard that the Bureau of Tourism was laying on an emergency bus service from the Hyatt to the airport so we took Netra and a couple of his friends as porters and walked the 20 minutes over there. We had an hour or so to kill so we took a very posh coffee on the poolside terrace. The overnight heavy rain had left the air cleaner than it had been for months and the second day of transport bans had a positive eff ect on pollution levels. As promised, a battered blue and white government bus trundled into the beautiful forecourt of the Hyatt exactly at 11 am. It looked a little out of place. Our little band of departing customers was soon on board (minus Russ and Andy who were still trying to get down to Chitwan). Sad to see you all go but I am sure some of you will be back. Hope the joy of Nepal stays with you for a while. Russ and Andy never did get to Chitwan. The political situation became even more tense during the last days we were there. We amused ourselves hanging around Kopan and Bouda, eating Muna’s lovely home-cooked meals, visiting Dorje at home and walking up to Kopan Gomba (again). The guys moved to the Hyatt for their last days but my last goodbye to them was cut short by the arrival of the airport bus – rumoured to be the only one for the day. I took the bus. It took two hours to go to the airport, via the city. It was an extremely interesting tour through the heart of the demonstrating crowds. The rowdy but good-natured protesters looked amazing in an ocean of red flags. I’ve since heard that the boys got out next day without incident. The situation has since returned to normal in Kathmandu although a deadline has been set for May 28 to agree to a new constitution. Here’s hoping!